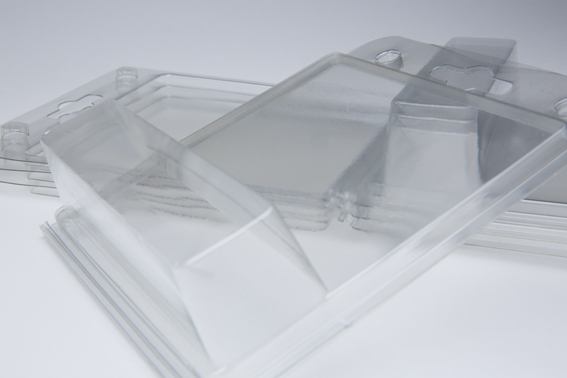 Folding blister (clamshell), the perfect single-material packaging with a completely clear view of the product. Insert product, fold blister, done. clamshell are blister packs, usually made of clear plastic films, which are thermoformed in a thermal process. clamshell blisters are visually very appealing and can be closed without folding process by folding with "click mechanisms". A distinction is made between welded packaging and folding packaging (sealed blister) , clamping packaging (sliding blister) and folding packaging (clamshell) . In addition to clamshell-blister, our portfolio also includes other types of transparent packaging , which we produce according to your individual wishes. These include sealed blister and blister hoods, sliding blister, double blister and plastic tray's . We help you solve your packaging problem.